Recently, I wrote about the Great Snow of 1717 a series of 4 storms in 10 days. When that event was over, Cotton Mather reported 3 feet of snow in Boston Common in what was an unprecedented snow event. Fast forward almost exactly 300 years and we have done it again and then some. What’s transpired meteorologically the past 18 days is simply amazing. Part of the reason it’s so incredible is because we don’t have anything officially in the record books to compare this to. We’ve had more snow than any other 14,20 or even 30 day period since the late 1800s and there is still more snow in the forecast. It’s not only the snow, but the cold too. Since the onslaught of snow began the lack of warm air has kept much of the snow from melting. Ironically, it’s the prolonged cold which has allowed the snow to pile so high, but has also prevented a heavy wet snow which would have been devastating to the power grid. There are so many ways to view all this snow. Meteorologcially it’s fascinating to see records being shattered. But the records only go back 130 years or so, a small amount of time when you widen the window of the past beyond what we’ve recorded. How do we know this type of event wasn’t occurring 500 years ago or some other time period? It’s historical to us, in our records, but where it fits in the big picture we really have no idea. We try to form some meaning around it all, but in actuality it’s just a lot of snow. In 8 weeks, it will be gone, just a few large piles remaining in scattered parking lots or in the deep shade on the north side of your house. This area many of us live and work is a leader in so many arenas. Millions of us go to daily jobs feeling the pressure of performing for our co-workers, our boss or self-imposed ideas on taking our career to a higher level. Now, the snow has just put a halt to much of it. Sure you can work from home, but the meeting you had yesterday or today is cancelled. While the day off might seem relaxing for some, stress levels may have actually increased due to the lack of being able to get stuff done. Students are missing school, teachers aren’t able to teach, a house that was being built down the road halted construction and the state’s largest mass transit system isn’t even working. In 1987 when the stock market crashed it looked like a really big deal and in many ways it was. But nearly 28 years later that dip has been smoothed by time and is barely noticeable on a chart of the Dow Jones Industrial over the past 100 years. At some point in the future, maybe next week, maybe next year, all that is being missed during this Great Snow of 2015 will be barely a memory. You’ll likely remember the snowbanks, the shoveling, the days off from school, but most of the other stuff just fades with time. This isn’t to diminish the real affects and pain the snow is causing. Medical emergencies and other public safety issues are real and hurt real people. The snow has highlighted what we all knew; the public transit system on which so many depend isn’t dependable. I can’t imagine the pressure being felt by those charged with maintaining or managing this system. The snow has reminded us of the vulnerability of so many who reply on on public transportation in getting from point A to B. 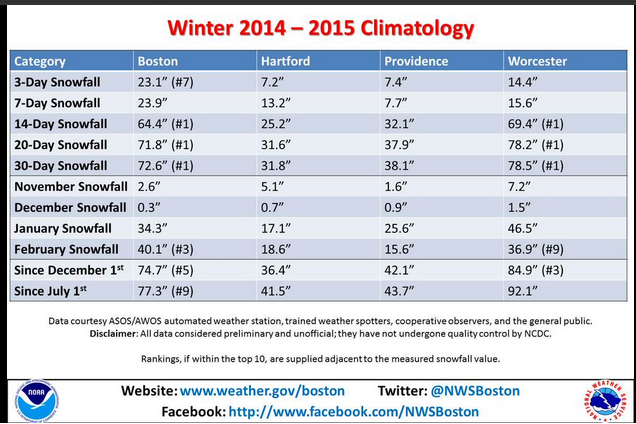 If we add another major storm, the danger level in Boston and other urban areas will grow even more precarious. 20 days ago, when the ground was bare, traffic was a part of living here. Today, because of the snow, the use of a car in the areas hardest hit by all the snow takes on a whole new meaning. At least for the next few weeks, the added time to go somewhere must now be factored in to our lives. Trillions upon trillions of tiny crystals have forced a collective traffic jam normally reserved for Friday night commutes to Cape Cod in the summer or the occasional weekday snowstorm in winter. The Great Snow of 2015 isn’t over. There is more snow coming Thursday and perhaps again on Sunday. I’ll update here and on Twitter @growingwisdom on those two possibilities later today. As the streets continue to narrow and our tolerance and patience for the transformed world we live grows short, think about the collective experience all of us are sharing. No one is immune from these storms; all of us have our own way of existing during this historical period of weather. You might not be fazed by the winter onslaught, perhaps you even enjoy it. Maybe you would do anything to be anywhere else, but no matter what your feelings about it, we’re all living it. Everyone has a story about the snow or what the snow is doing. Ice dams might force water to be coming down the walls of your living room, or the snow banks are so high you take your life into your hands every time you pull out of your driveway. Maybe you’ve shoveled paths or even tunnels for your dog or child so much your aching back is making it hard to walk correctly. Perhaps you’ve been feeling like you’re solely responsible for keeping the birds alive through all these storms. Or possibly, you’ve made more money than you could ever have hoped for in a single winter season plowing. Whatever your personal take on this, everyone is connected, because most of us can’t escape the weather. We often use the term “hardy” as a way for New Englanders to describe ourselves. 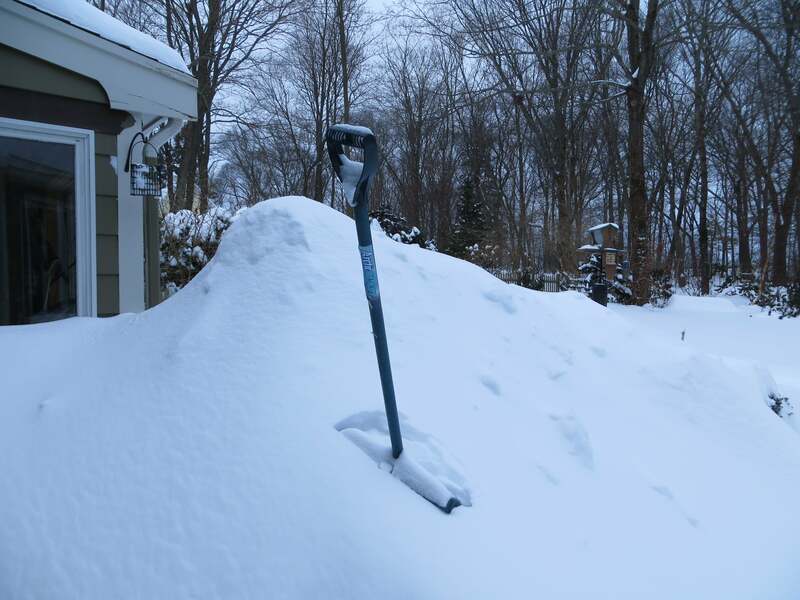 We are agile and nimble, smart and innovative, we will keep on shoveling and pushing through, that is what we do. When summer arrives, we’ll still talk about it, brag about it, show pictures of it and recount how collectively, how we shoveled, pushed, climbed, and moved all that snow making it through the Great Snow of 2015.